1. Preheat oven to 350° F. Mix sage, garlic salt, ginger and black pepper in small bowl. Place roast in foil-lined roasting pan with fat side down. Brush entire surface with oil. Rub seasoning mixture evenly over roast. Pour apple juice into pan. 2. Roast 1 1/4 hours or until desired doneness, basting with pan juices every 20 minutes. Transfer pork to cutting board. Cover loosely with foil. Let stand 15 minutes before slicing. 3. Mix 2/3 cup of the juices from roasting pan and 1 1/3 cups water (or enough liquid to measure 2 cups) in medium saucepan. 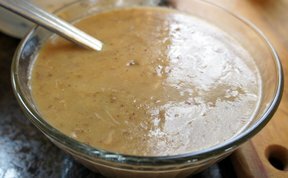 Stir in Gravy Mixes. Stirring frequently, cook on medium heat until gravy comes to boil. Reduce heat to low; simmer 1 minute or until slightly thickened. Serve with pork roast.